I originally planed to post three times a week and I haven’t since last Monday due to a death in my family. I do hope to post more articles soon. During this time I have learned a few lessons and have learned that you never want to be limited by money. I had to take almost a week off of work yet my expenses spiked since I ate out more often in addition to filling up sooner then I would have liked to. On top of it I have finals next week and still have to finish projects from earlier in the month. I do hope you the reader understand. I want to publish good articles and not just something I thrown together in five minutes, which at this time I just decided to take a break from it all and I plan on starting back within a week. Is it okay to play the lottery? Here is one issue I see regularly on various Personal Finance sites. Is it considered okay to play the lottery? My stance on the issue is it is alright, but in moderation. Below I listed the various Pros and Cons and then I give my argument below. So long as it’s money you don’t need and you only play every so often no harm should be done. There can be an Entertainment value thinking of what if I win. Several states use Lottery winnings to fund education. It can be a social event like in an office pool and can lighten the mood. You can have a gambling problem. If you overspend you could end up in debt. Is viewed as a “tax” on the low income. Several views it as a way out of poverty and/or a way to fund retirement. I’m sure the list could go on, but those are the main point from several sites that I have read. I do believe it’s okay so long as it’s what several other Personal Finance sites and myself call “fun” money. I will have cash on occasion to buy small items such as drinks and snacks. If I was to buy a lottery ticket it would just mean one less coke to buy. Also, a part of my college cost are paid via a scholarship fund that is funded in part from the state’s lottery. Plus I have over heard several people doing “what ifs” such as “If I won the lottery I would by a new car” and would get all excited and would have enjoyment from the thrills of the possibility, however slim it may be. 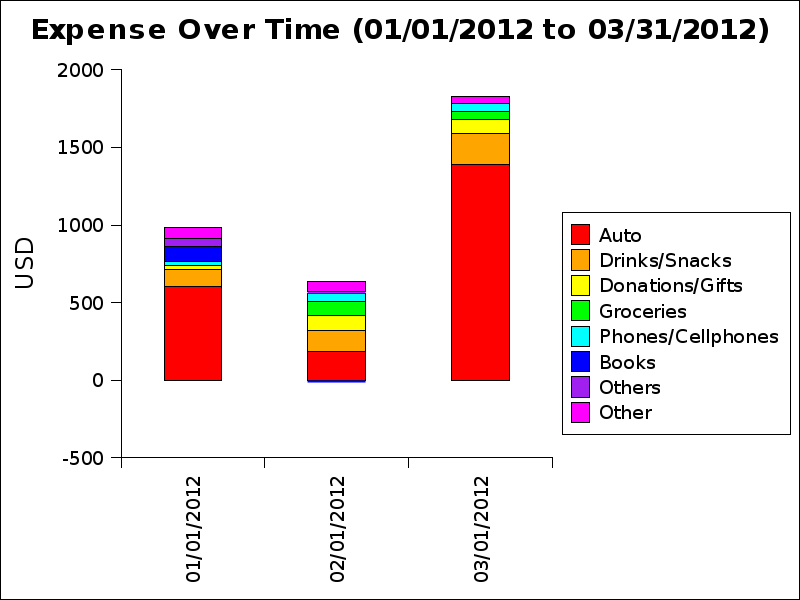 With the first quarter of 2012 coming to a close, I will be sharing with you my financial progress report. But first, I should explain what my goals are. Listed below are my simple goals for 2012 organized by category. Have two months living expenses in a savings account. I.e. an Emergency Fund. For me this would be about $1000. In the past I’ve had a much smaller E. Fund, but my income was to low one month and I have yet to build it back up. Make sure I am setting back money for Taxes, I am learning this the hard way on my 2011 Taxes. My goal on this for 2012 is to owe less then $100. Have a slush fund of sorts – I have a few expenses I always forget to plan for (Oil changes, web hosting, etc) My goal for 2012 is to get the big offenders out of a slush fund. Finally, I want to have money saved up for a place to live. From my last post you can tell I would much rather start small and pay for the house outright. But at the moment it looks like I may have to rent until I get enough saved. The only debt I have currently is a student loan. I hope to have at least $750 of the principal paid off by the end of 2012. I really wish it would be paid off by December, so I may throw some extra money into it. I do have a credit card, but it’s a secured credit card with a $200 limit. It gets paid off every month if I use it and in 2012 I hope to use this card less. When I first got the card I placed $120 on it and since the start of 2012 it hasn’t been over $60. I own a business and I really hope to have it take off this year. In 2012 my business grossed about 10k or 11k. Almost half of that is from subcontracted services. In 2012 I want to see my business pass the $20,000 in gross sales mark. I also want to diversify my income and for 2012 I want to start having passive income. I am not sure what I’ll do yet, but I would like to set a goal of having $250/mo by the end of 2012. I plan to sit down at the end of this quarter and examine all the money that I paid out and find ways to reduce it and to make a budget. I used to follow a budget but then I got a car and it just went out the window. This is in relation to savings also. But the money I don’t spend on an Item I want to start saving away. I used to buy snacks and pop often and I would like to add to my savings every time I get the temptation, instead of buying. Well that’s my 2012 Money Goals as of right now. Make sure you check back in Mid April for my first quarter financial report to see how much or little progress I have made.